Compare with other seller's laser engraver, the mainboard of our laser engraver is easy to maintain. This brand new CO2 laser engraver is equipped with one 40W water cooling laser tube, high precise stepping motors, high quality control board. 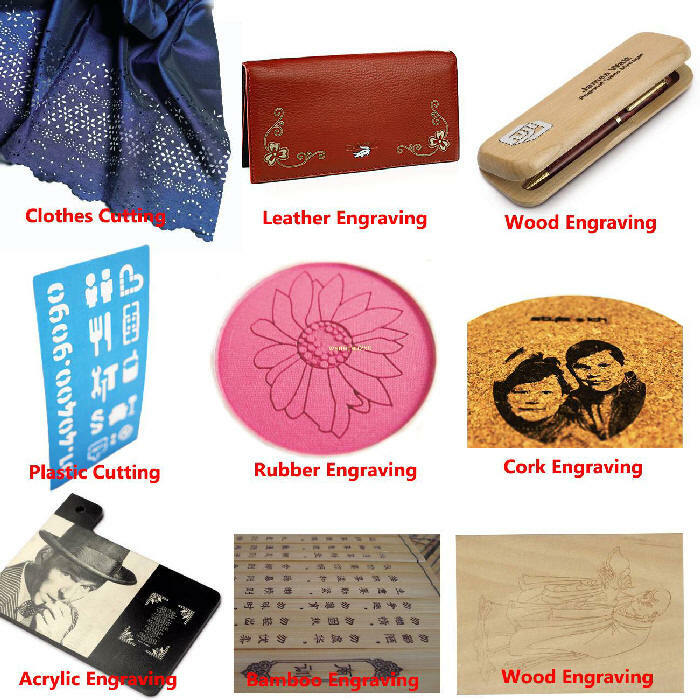 The Computerized Mini Laser Engraving and Cutting Machine is suitable for various materials: such as bamboo piece, double-color planks, boulder, horns, leather, crystal, wood, organic plastic, paper ,film, canvas, Acrylic and Plastics and other metallic materials（just carving on the shallow surface of the metal). This machine is suitable to seal engraving, advertisement, art gift, garment, leather, toy, building upholster, computerized embroidery, packing and printing, paper product, garments sampling, large width tailoring, shoemaking, furniture, industry, craftwork, nameplates decorations, woodcut and other industries. This machine integrates the newest light, machine and electricity mechanical movement to design this hign precise and high speed three generation modal CO2 LASER Engraver. 2.CorelLASER/LaserDRW Software Included. CorelLASER/LaserDRW has the ability of both NewlySeal and NewlyDraw and so it can be employeed in both carving and cutting works. 3. Adopt Japan imported mainboard and chip which can control the engraving more precise. 4. Adopt Germany imported bearing and high accuracy stepping belt which not only make the engraving more precise, also make the machine life time twice to three times than ordinary CO2 LASER Engraver. 5. The reinforced and thickened machine body make transportation absolutely to be safer and longer life time. 6. Built the heat dispersed fan to reduce all electronic component's temperature. Thus lengthen electronic component's life and the higher technical volatility. 7. High Precision Stepping motor makes engraving more precise. 8. This machine supports any kind of model printer, the scanner.Be compatible with TIF international standard fonts and BMP/JPG/JPEG/WMF/EMF/PLT. 1． Make sure the voltage is correct; keep the machine well grounded. 2． Make sure the recycle water in clear, circulated condition to get good engraving effect. 3． Must Close the cover plate when using the machine to avoid laser injury. 4． Clean the mirrors by alcohol regularly.